how to install apk apps or game on blackberry? 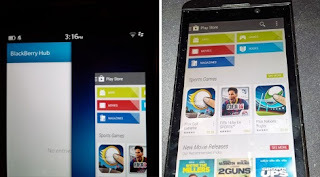 how to install google play store on blackberry? This post will answer all the above question and more. without wasting much of your time below is the procedure. First of all you need to download the following apk files on your BlackBerry using any browser. * Intall and run com.google.android.gsf.login, then login with your Google account information. * Install and run cobalt.backberry.googleID, and register your device with Google Play. * Close the two apps above and proceed to the next step. * Install and run com.android.vending to start enjoying Google Play Store! Note: The method works with all Blackberry devices running OS 10.3 and better. OS 10.2.x is not supported. All three apps must remain on your BlackBerry Z10 device. Google Play may stop working if any of the apps missed. * Get refund for paid apps (if supported by developer) and many more.